Eugènia Balcells was born in 1943 in Barcelona, where she graduated in Technical Architecture. The daughter and granddaughter of architects and inventors, her daily contact with all kinds of instruments and devices related to vision, optics and mathematics started her off on an apprenticeship in the fragile balance between the material and the intangible, the illusory and the exact. She moved to New York in 1968 and completed her training at the University of Iowa, where she was awarded an M.A. in Art in 1971. She then alternated between Barcelona and New York until 1979, when she made the United States her fixed place of residence. Since 1988 she has once again divided her time between the two cities. She started out on her artistic career in the mid seventies in the context of conceptual art, and was one of the pioneers of experimental cinema and audio-visual art in Spain. Her first installations, films and videos that can be identified with the critical-sociological current, deal with themes relating to contemporary consumer society and the effects of the media on mass culture. Towards the end of the seventies Eugènia Balcells began using the circle in some of her most important works, on the one hand as a physical description of the motion of a camera located in the center of the space, and on the other as a formal concept employed in the compositional structure of the installation. This strategy can be seen in the film FUGA [Escape] (1979), in the video INDIAN CIRCLE (winner of the Grand Prix at the 1ère Manifestation Internationale de Vidéo in Montbeliard, 1982) and the video installation FROM THE CENTER (awarded a prize at the Visual Studies Workshop, Rochester, NY, 1983). Between 1981 and 1982, on the strength of a series of contacts with American musicians, notably Peter van Riper, and as a continuation of her exploration of the relations between sounds and images in her film 133 (1979), she produced a series of works entitled SOUND WORKS. Her exploration of the limits of visual perception in two 1980s video installations — COLOR FIELDS, presented at the 1st National Video Festival at the Círculo de Bellas Artes in Madrid (1984), and TV WEAVE, presented at the Institute for Art and Urban Resources, P.S.1, New York (1985) — brought her to a new understanding of the electronic image. With TV WEAVE she took part in the exhibition First Generation – Art and Image in Movement organized by the Museo Nacional Centro de Arte Reina Sofía (2006-2007). This show was articulated around the works and ideas of the first artists to use video in their work anywhere in the world. Our confrontation as human beings with our own existence and the harmonies and dissonances in our interpersonal relations are the central themes of works such as THEY REST AS IN THE MATERNAL HOME I and II, IN TRANSIT and SYNCHRONIES, presented at the Museo Nacional Centro de Arte Reina Sofía in Madrid in 1995. In the installation GOING THROUGH LIMITS—part of the exhibition SEEING THE LIGHT at the Museu d’Art Contemporani de Barcelona (MACBA) in 1996— she addressed the interaction of the complementary functions of the two hemispheres of the human brain. The six translucent screens permeated by images from two opposing projectors suggested a metaphor for the coexistence of intuitive and rational worlds. Her work comprises a large number of audio-visual installations. At times she reflects explicitly on the light, one of the interests that runs through all of her research as a creative artist and a teacher. Her most recent work for a public space is GARDEN OF LIGHT-COLLSEROLA (2003), a permanent installation in the Ciutat Meridiana subway station in Barcelona. Eugènia Balcells’ interest in everyday objects—already evident in such early works as SUPERMERCART, CLEAR BOOKS—is the basis for her exploration of the human habitat by way of the objects found in each space and their symbolic and energetic presence. The exhibition IN THE HEART OF THINGS consists of five audio-visual installations that correspond to the essential spaces of a house—LIVING ROOM, KITCHEN, DINING ROOM, BEDROOM and BATHROOM—and was presented at Tinglado 2 in Tarragona in 1998. Another work that uses everyday objects, RODA DO TEMPO [TIME WHEEL], is a reflection on time: the cyclical time of nature, the dialectic time of history, subjective time, imaginary time, the non-existence of time, the coexistence of all times. This installation was commissioned by the Centre Cultural Banco do Brasil in Rio de Janeiro in 2001. In a number of her works Eugènia Balcells has engaged with the image and the role of women in culture and the need to pay tribute to the legacy of history (CROSSING THROUGH LANGUAGES, PORTABLE ALBUM), and she depicts women in constant transformation immersed in the waves of the sea as a metaphor for life in A SPACE OF ONE’S OWN (2000). This homage to Virginia Woolf was commissioned by the Centre de Cultura Contemporània de Barcelona (CCCB) and explores the boundaries between the inner and exterior worlds. By way of welcome to the new millennium she created TOAST (Invitation to Abundance) (1999-2000), presented at the Galeria Alter Ego in Barcelona and the Casa de las Américas in Madrid. This work invokes abundance, plenitude, happiness and festivity in a celebration of life that invites us to fill our glasses and toast our best wishes. Her installation ON AND ON (2000), a work of synthesis that utilizing everyday objects generates new poetics of perception, formed part of the exhibition The Discreet Charm of Technology - Arts in Spain at the MEIAC museum in Badajoz and the ZKM Center for Art and Media in Karlsruhe, Germany. This installation was also presented in July 2009 at the Fontana d’Or in Girona. The most recent art project of Eugènia Balcells is FREQUENCIES, which revolves around light and color as the elements that distinguish—at once enabling and framing— visual perception. In this work she sets out to create almost holographic images in which different planes coexist in order to represent reality as a weaving of frequencies. The poetic nature of the work is underpinned by the encounter between science and the arts, always so fragile and so powerful. This project was presented in September 2009 at Arts Santa Mònica in Barcelona and is currently at the Museo de Arte Contemporaneo Gas Natural-Fenosa in A Coruña until July 2011. The intention is for this travelling exhibition project to be enhanced in each venue by the addition of a new installation. In recent years Eugènia Balcells has combined intense creative activity with teaching at a number of art and science centers and universities. In her workshops she engages with light as creative essence, integrating into her vision different forms of knowledge such as philosophy, literature, poetry and physics. 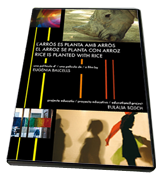 RICE IS PLANTED WITH RICE is a film where Balcells explores the educational repercussion of her exhibition FREQUENCIES in Barcelona. In February 2010, Eugenia Balcells was awarded by the King of Spain the Gold Medal for Merit in the Fine Arts. 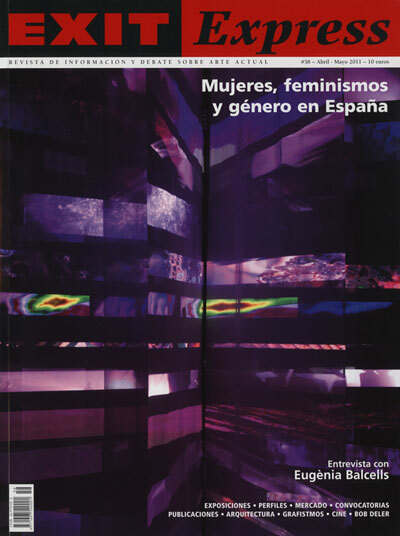 Her exhibition FREQUENCIES was awarded by the Generalitat de Catalunya the 2010 National Prize for the Visual Arts.